There’s no question that pizza is one of the most beloved foods in America. According to a USDA report, about one in eight Americans consume pizza on any given day. That number jumps to one in four if you limit it to American males. But where can you get the best slice without breaking the bank? Below we look at this and other factors to find the best cities for pizza lovers in America. Spending a lot on eating out? You might be missing out if you don’t have the best rewards credit cards. 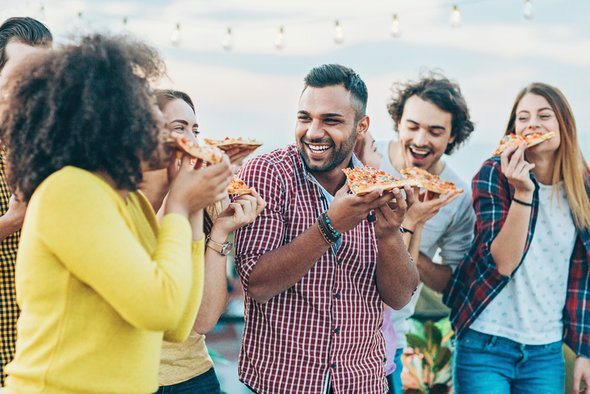 In order to find the best cities for pizza lovers, we analyzed data on total number of pizza places, average quality of pizza places, the percent of pizza places which are highly rated, the number of pizza places per 10,000 residents and the local cost of living. Check out our data and methodology section to see where we got our data and how we put it together. 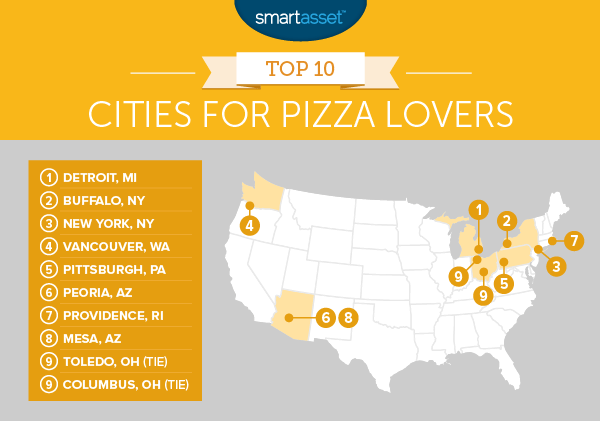 This is SmartAsset’s second annual study on the best cities for pizza lovers. Check out the 2016 version here. Midwestern cities score well – Three of our 10 best cities for pizza lovers are in the Midwest. This includes Detroit which took the top spot. Midwestern cities tend to combine a relatively low cost of living with a large number of pizza spots. Avoid the South – If you are truly pizza obsessed, you may not want to call the South home. In general Southern cities don’t have that many pizza spots and the ones they do have aren’t that highly rated. In total, seven of the 10 worst cities for pizza lovers are in the South. No Chicago deep dish – Chicago, famous for its deep dish pizza, did not crack this top 10. In fact Chicago, ranked 43rd overall, barely making the top 50. You may be wondering why this was so. Well, according to our data, Yelpers are harsh critics when it comes to Chicago deep dish. The Windy City scored poorly in both of our quality of pizza metrics. One could argue that Chicago residents simply have higher standards for pizza, which is reflected in their harsher Yelp reviews. That’s certainly a possibility. The city also took a hit when it came to our cost of living metric. This year, Detroit takes our title as pizza capital of the U.S. The Motor City, like Chicago and New York, is famous for having its own pizza style. Detroit-style pizza is typically square, deep dish and has an extra crispy crust. In this sense it can be seen as a cross between the New York, Chicago and Sicilian pizza traditions. Detroit has about 1,050 pizza places for pizza lovers to try. Don’t expect these places to be too crowded, either. There are about 15.5 pizza places for every 10,000 residents in Detroit. In terms of quality, Detroit also scores well. The average pizza place in Detroit has a Yelp rating of 3.42. However, if you are a true pizza connoisseur and you’re only visiting Detroit for a brief time, you may want to do some research ahead of time. Only 11% of pizza places here have an average rating above 4.4, meaning popping into just any place may leave you disappointed. Buffalo is the second-best city for pizza lovers. This city is probably most famous for coming up with the best way to eat a chicken wing, but did you know it has innovated on the pizza as well? Buffalo-style pizza tends to have a thicker crust, like Detroit-style pizza, but is round rather than square. Residents here are also big fans of white pizzas. This city has about 12.1 pizza places per 10,000 residents, 17th-most in the country. Plus, the pizza here is solid according to Buffalo Yelpers. The average pizza place in Buffalo has a Yelp rating around 3.48, the 12th-highest average rating in our study. The City That Never Sleeps has over 2,600 pizza places according to our data. That is a lot of pizza and is possibly too many for any one person to try. Fortunately, you probably won’t need to go far in New York to find a pizza place that suits your palate. The average pizza place here has an average rating of 3.81 (highest in our study) and 17% of them have an average rating over 4.4, a top 25 rate. So why doesn’t New York score higher? Well, it’s expensive. New York was one of the most expensive cities in our data set. Plus, in per capita terms, the number of pizza places in New York is not that remarkable. New York has about 3.09 pizza places per 10,000 residents. Vancouver, the next city in our top 10 has a ratio of pizza places to population that’s six times higher. Tourists, don’t forget to fold your slice for the true New York pizza experience! As mentioned, on a per capita basis, Vancouver is pizza central. This city has the seventh-highest rate of pizza places per 10,000 residents in the study at 18.8. In terms of raw numbers however there are roughly 326 places. The average pizza place in Vancouver has a rating of 3.49 (11th-highest in the country) and about 16% of pizza places have an average rating surpassing 4.4. Vancouver is weighed down by high costs of living in the area. Vancouver ranks 101st in the study when it comes to affordability. Although of course if you really want to live in Vancouver but your budget is tight there are other ways to save, especially if you enjoy eating out at your favorite pizza places. Some rewards credit cards come with double points in categories like dining out. Pittsburgh has been on foodies’ lips since Zagat named it the best food city back in 2015. We also previously found that the Steel City is the fourth-best city for foodies, so it may be no surprise to see it pop up here. The city is the most affordable pizza town in our study. According to our data, living in Pittsburgh costs about 6% less than the national average. On top of that there is a decent amount of variety when it comes to pizza in the Steel City. This city has over 270 pizza spots and around 16% of them have an average rating above 4.4 on Yelp. Peoria claims the sixth spot because of the sheer availability of pizza in the area. This area has the most pizza places per 10,000 residents in the study at 45. Pizza places in Peoria are also serving up solid pizza. Yelp users gave Peoria pizza places an average rating of 3.3, which is above average. Also, over 15% of pizza places in this city have an average rating above 4.4, which ranks 40th in the study. According to our data, the pizza in Rhode Island is pretty tasty at just about any pizzeria you go to. The average pizza place in Providence is rated 3.45, while 14% of those pizza places have an average rating above 4.4. The knock on Providence is the total number of pizza places. Providence only has 210 pizza places, that’s 59th-most in the study. Relative to population, though, the pizza scene looks better. This city has 11.72 pizza places per 10,000 residents, or 19th-most in our study. Mesa is the second Phoenix satellite city to land in our top 10 after Peoria. Overall our data suggests there are about 17.7 pizza places per 10,000 residents in Mesa, a top 10 rate. As far as quality, the pizza here is also good. The average pizza place gets a rating of 3.34, which is above the national average, and about 12% of pizza places are rated above 4.4, also an above-average rate. Another plus to living in Mesa is the low income tax rates in Arizona. Toledo cracks our list thanks to a winning combo of tasty pizza and affordable living. According to our data, living in Toledo is about 6% more affordable than the U.S. average, meaning the pizza should cost less and residents should have more money for pizza. The pizza in Toledo seems pretty delicious, too. The average pizza place is rated above 3.45, the 20th-best in the study. The capital of Ohio takes our final spot. There are about 450 pizza places in Columbus, a score beaten by only 18 other cities. In addition, the cost of living in Columbus is about 2% less than the U.S. average. That means more money to spend on a slice for all the pizza lovers in Columbus. Total number of pizza places. This data comes from Yelp. Pizza places per 10,000 residents. Data on total number of pizza places comes from Yelp. Population data comes from the U.S. Census Bureau’s 2015 American Community Survey. Average Yelp rating for pizza places. This measures how good the average pizza place is in each city is. Data comes from Yelp. Percent of pizza places with an average rating above 4.4. This metric measures the frequency of outstanding pizza places. Data comes from Yelp. Cost of living. Data on cost of living comes from MIT living wage study. This is measured at the county level. 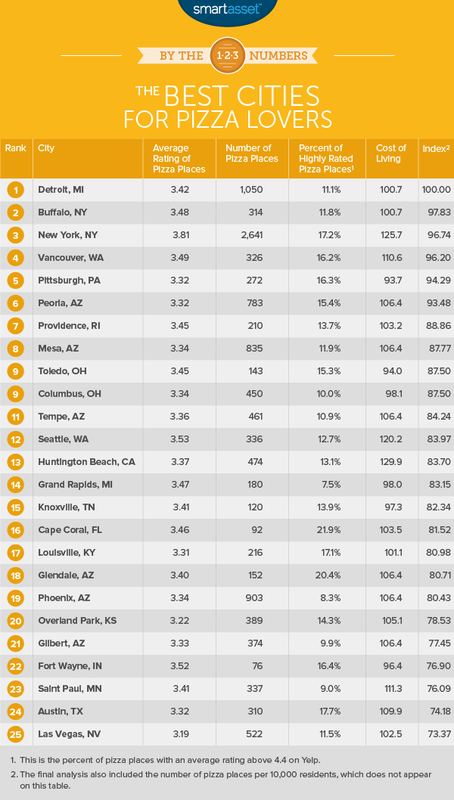 First, we ranked each city in each metric. Then we found each city’s average ranking, giving the total number of pizza places and the average rating of pizza places a double weighting. We also gave pizza places per 10,000 residents a half weighting. We used this average ranking to create our final score. The city with the best average ranking received a 100. The city with the worst average ranking received a 0. If you are the type of person who likes to eat out a lot you but doesn’t really track how you spend, you may be missing out on the chance to earn while you spend – particularly if you use credit cards. Here are some tips for making the most out of your rewards credit cards while eating. Make sure you are using the optimal credit card for the category you spend in most. For example, some cards come with extra rewards on grocery shopping while other give bonus points at restaurants. If the majority of your budget goes toward eating out, you may want a rewards credit card that awards extra points for dining. Pay attention to timely promotions as well. Some cash back cards offer bonus points in rotating categories during different times of year, by keeping track of these promotions you can get the most bang for your buck. Another thing to consider: most rewards cards have spending limits for what they will give cash back for. Say, for example, a credit card is offering 3% cash back at restaurants, typically they will cap the total amount you can earn. This means once you hit that limit you will stop earning the special bonus reward. One way to get around this, especially if you are hitting that limit, is to have multiple credit cards. By spreading your spending around multiple credit cards you can always earn the special bonuses. The downside to this strategy is the annual fees. Many cards come with annual fees and if those fees are high enough, you may end up spending more than you save. And of course, you should never be spending more than you usually would just to earn extra credit card rewards. Make sure that you’re using any credit cards you have responsibly. It’s important to make all your payments on time and it’s best to pay off your balance in full each month if you can afford to do so to avoid paying high interest rates.